2007 Summer Project for Shawl Ministry -- August 11, 2007 4:35 pm. a book about what the Shawl Ministry is all about, with the history behind the official Knit 3, Pearl 3 pattern, and other suggestions, prayers, patterns, etc. 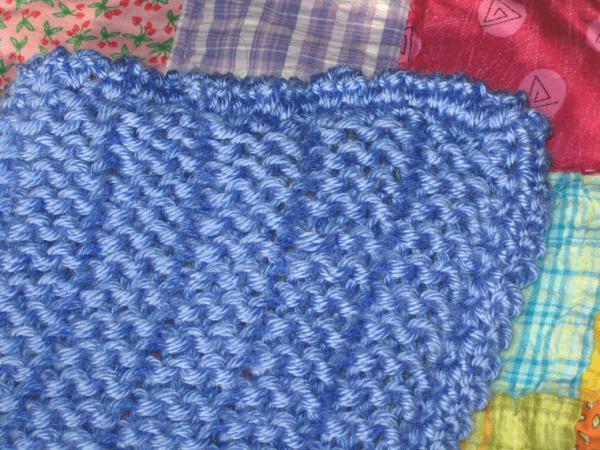 When Eleanor's husband died suddenly two years ago, a friend sent her a shawl as a way to send God's love and comfort to her. There was a blessing attached to it. May God’s grace be upon this shawl…warm, comforting, enfolding and embracing. May this mantle be a safe haven…a sacred place of security and well-being… Sustaining and embracing in good times as well as difficult ones. May the one who receives this shawl be cradled in hope, kept in joy, graced with peace and wrapped in love. Amen." Eleanor was touched and comforted by the card and shawl, and when she moved to Los Angeles from Georgia, she wanted to make one for someone else. As Membership Nurture and Care Chair for the UMW at Riviera, this sounded like a great idea; creating shawls and lap robes for those undergoing difficult times, and in need of a hug and reassurance of God's love, and having fun and fellowship at the same time. Well, the Holy Spirit roared through the knitters and crocheters, and those who want to learn in our church, and before we knew it, there were 20 women /girls (12-90!) coming to gather every third Sunday of the month to learn from each other, knit /crochet and prepare finished shawls; 30 by the end of June!! Being Methodists, we are an accepting group, with a wide variety of skills, and accept any shawl /lap robe in any pattern. Having not knitted since I was 12, my first shawl was an easy pattern put together by Eleanor, who teaches kids to knit. I called it The Rasberry Wonder - because it was a wonder that I finished it. ha ha ha ha. I got carried away and it wound up 4 inches longer than called for. My second effort was finished last weekend - Aug.4th. I wanted to master the K3P3 pattern, so I decided to tackle 7 inch, 21 stitch squares instead of a 63 stitch shawl. 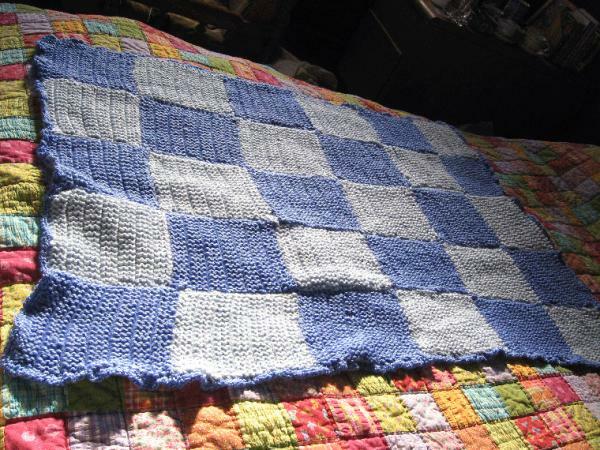 Because I doubled up on size 7 baby yarn and used 11 sized needles, (I wanted to be able to really see the pattern), it turned out really warm, and 30 squares in total. I call it The Thermal One! It was a learning project for me. I learned the K3P3 pattern and with the help of friends, Dorthy & my neighbor, Edith, I dipped my toe into the world of crocheting. This is what has been keeping me out of trouble, my mind off my own annoyances / worries, and my focus on creating something for someone else's comfort in time of trials. Crocheted around the edge to finish it. Close up of K3P3 pattern, and my crocheting efforts. This is really beautiful! I'm impressed! that is so neat you will need to show me how to knit either when I come out for a bunker visit or if you come up with Tom, that would probally be relaxing. It really did turn out great! Looks great Julie! 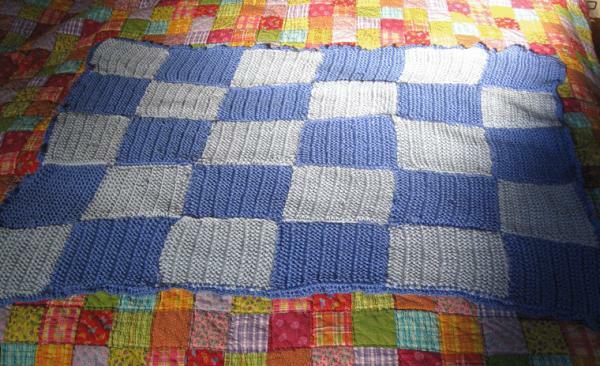 I still have my great-grandmother's quilts and such; they are comforting. I just can't sit for very long!